Instant Home knows nothing beats a good bed. That’s why we’ve commissioned a leading and established UK company to manufacture beds to our own specification. We selected them for their innovative design, manufacturing excellence and craftsmanship. You won’t find them anywhere else! 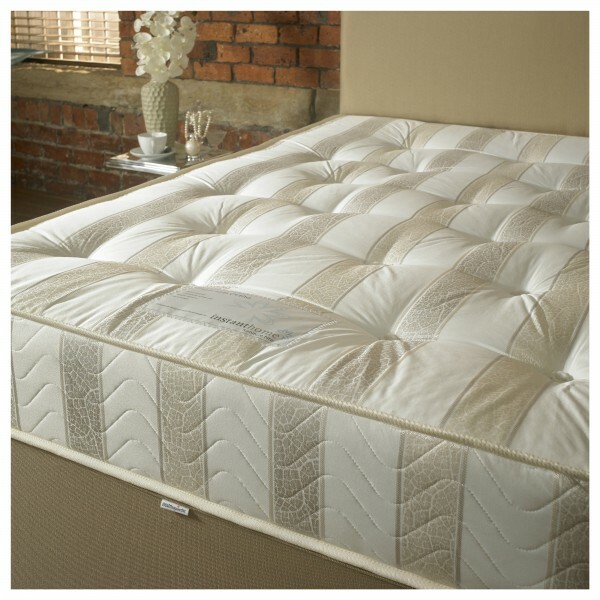 A wonderfully comfortable orthopaedic bed, the Platinum Ortho will lull you gently through each night with its extra thick layer of white fibre fillings. Featuring a 12.5 gauge bonnel spring system, this deep tufted, high loft orthopaedic mattress is covered in quality damask with sewn borders, finished by hand. At instant home we take health and hygiene very seriously, so all of our mattresses are delivered and installed with a complete sealed mattress encasement protector. The protector has many features and benefits to give you the customer and, us here at Instant Home, complete peace of mind. The encapsulator is made of a smooth woven fabric that you really don’t know is there. The ‘miracle’ membrane underneath the top surface is a two way barrier that is 100pct waterproof. This provides protection against moisture, allergens, dust mites and bed bugs entering the bed, whilst remaining air vapour porous promoting a cool, comfortable sleep temperature.